Yes, my family is feeling it all ready...cold/flu season. My children have had some stuffy noses, dry skin and coughs, but we immediately pulled out our humidifiers and put one in each room. The brand we trust most and use throughout our house is Crane! This cold/flu season, Crane has some great tips and info to help your children and families get through cold/flu season! Check them out below! Young children commonly get about 6 - 8 colds and upper respiratory tract infections each year. Due to the risk of overdose, the FDA and pediatricians recommend not giving over the counter cough and cold medicine to children under the age of six. Humidifiers help with overall cold and flu symptoms. A cool mist humidifier is preferred over a warm mist humidifier because the water does not boil. When breastfeeding, it is important for infants to be able to easily breathe through their noses. Using a humidifier helps to loosen nasal congestion, prevent nosebleeds and moisten sinus and nasal passages making breathing through the nose much easier. If your infant cannot easily breathe through his or her nose, it can be frustrating and difficult for mother and child during nursing. 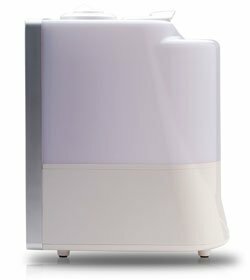 What is the difference between a cool mist and a warm mist humidifier? Warm mist humidifiers produce a warm mist by boiling the water in the humidifier to produce steam. Ultrasonic humidifiers generate a cool mist when a thin film of water is passed over a rapidly vibrating transducer. The vibration breaks the water up into tiny droplets and emits a whisper quiet cool mist. What is the difference between a humidifier and an air purifier? Humidifiers add moisture to a room or home by dispersing water vapor into the air. Air purifiers intake, purify, and output freshly cleaned air by removing particles and pollutants from the air. The humidifier I highly recommend this winter is the Crane Germ Defense Digital Ultrasonic Warm and Cool Mist Humidifier. For those who experience cold and cough symptoms, there are few things more soothing than breathing in moist air, especially during dry winter months or when cold symptoms are at their worst. The Crane ultrasonic humidifier runs for up to 24 hours and offers the choice of warm or cool mist, both of which are equally effective in humidifying the air. The Crane Germ Defense Digital Ultrasonic Warm and Cool Mist Humidifier adds moisture to the air, providing relief from sinus irritation, nasal congestion, dry cough, cold, and flu symptoms. Giving you the choice of warm or cool mist at the press of a button, this humidifier creates up to 2.5 gallons of moisture per day, runs up to 55 hours, and includes Antimicrobial Protection to fight mold and mildew in water tank and basin. Suitable for rooms up to 500 square feet. This humidifier does not require a filter to operate. A straightforward digital display makes this humidifier easy to set up and operate and the water reservoir lifts out of the unit, making it easy to fill and clean. Simply remove the water tank from the unit, unscrew the tank cap, and fill the water tank under a water faucet. Securely replace the tank cap, making sure the rubber cap seal is in place, and place the water tank back onto the unit. Place the humidifier on an elevated surface and set output for comfortable room humidification. An auto shut-off feature engages when the water tank is empty to ensure safety, and the humidifier's nozzle rotates 360 degrees, allowing you to control the direction of the mist. This humidifier is energy-efficient, using less power than a standard light bulb to run. Crane's Germ Defense humidifiers are embedded with small natural antimicrobial silver particles that help prevent bacteria, viruses, and mold from taking hold. This technology helps the humidifier to disperse a clean, germ-free mist. Buy It: You can purchase the Germ Defense Humidifier for $109.99 from the Crane website.